There’s a video gameness to the action in John Wick that would be risible if not for one of the titular hitman’s innumerable raids of retribution. As Wick (played by Keanu Reeves, made for this role) systemically takes out another den of villainy, one baddie is immersed in an interactive game of gunfire, oblivious to the “actual” bloody barrage happening around him. The irony, of course, is that the cinematic violence in John Wick is as real as a video game’s digital viscera. The scene is also a glimpse of self-awareness, almost an act of self-parody in keeping with the wicked wit that both permeates and elevates this pulpy, neo-Spaghetti Western. At first blush, Wick appears a scrawny, scruffy loner whose prized possessions are his ‘69 Ford Mustang and beagle puppy named Daisy, bequeathed by his deceased wife Helen (Bridget Moynahan) once she succumbed to cancer. After Wick rebuffs a Russian ruffian named Iosef (Alfie Allen) after he rudely offers to buy Wick’s car, Iosef and two of his thug pals break into Wick’s house, beat him with a bat, steal his car and, last but certainly not least, kills his pooch. Once Viggo’s cursory attempt to reason with Wick fails, he mobilizes all the muscle at his disposal to spare his son and himself from Wick’s revenge rampage, including a cadre of cannon fodder, an attractive assassin (Adrianne Palicki), and Marcus (Willem Defoe), a seasoned marksman armed with murky allegiances. The film succeeds based solely on its sublimely simple premise and intoxicating action sequences, including gun battles, knife fights and real car chases/crashes with real muscle cars. The action isn’t as stylized or well-designed as vintage John Woo or, say, The Raid series. But the inspiration is undeniable, and the homage is exhilarating. Director Chad Stahelski, a former stunt coordinator, expertly frames the imagery and fight choreography. However, the film transcends thanks to its brazenness, its cheeky vibe and the underworld-building it conjures. Its a subculture that includes on-call cadaver cleanup crews, aware but acquiescing cops, and a hotel named ‘The Continental,’ where hitmen/women can convalesce, socialize and escape the outside world, and violating the code forbidding fratricide on premises brings punitive punishment. 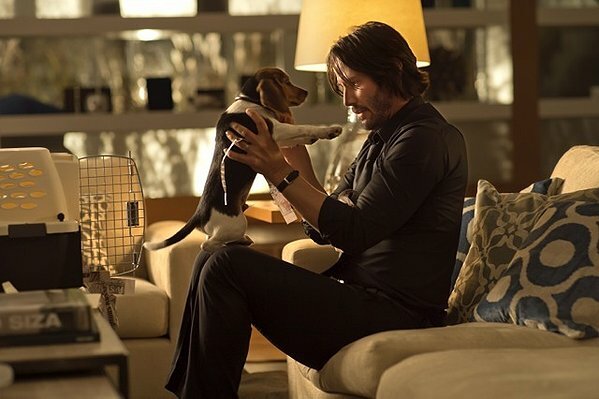 John Wick is an unapologetic B-movie polished with high-gloss revenge-thriller shine. It’s also Reeves’ best film role since The Matrix, admittedly a small hurdle to clear. The cheerfully ludicrous plot doesn’t require much dialogue from Reeves, but that suits Wick’s laconic, Eastwood-esque aura. And once Wick kneecaps a corrupt Catholic priest during a gunfight in the middle of a cathedral … well, praise the lord and pass the ammunition.